For past editions, see “who we are” section. On October 23 and 24, the members of the Open ENLoCC network met at an extraordinary General Assembly in Stuttgart at member Wirtschaftsförderung Region Stuttgart GmbH (WRS). The deliberations resulted in a unanimous decision to go for a registration as a non-profit association under Belgian law. The assembly welcomed two new network members: TØI from Oslo (Norway) and LCA-Süd from Fürnitz (Austria). This year’s General Assembly of the Open ENLoCC network was held in Newcastle (GB) on April 10-11, upon invitation of Open ENLoCC member NewRAIL. The first day was open to interested participants also from outside the Open ENLoCC network. The second day dealt with formal deliberations and technical discussions. As already done in Bologna and Kassel, a session about the current project work and interests in upcoming project cooperation was held on Wednesday. More about the meeting in the issue 3-2018 of the European Review of Regional Logistics. The 2017 General Assembly of the Open ENLoCC network was held in Kassel (D) on June 22-23, upon invitation of MoWiN, the mobility network of Northern Hesse State. Thursday afternoon was dedicated to an open debate of member projects, as well as to a visit of Volkswagen logistics in nearby Baunatal. Friday was dedicated to internal issues. A detailed report can be found in the “European Review of Regional Logistics”, issue 3-2017. 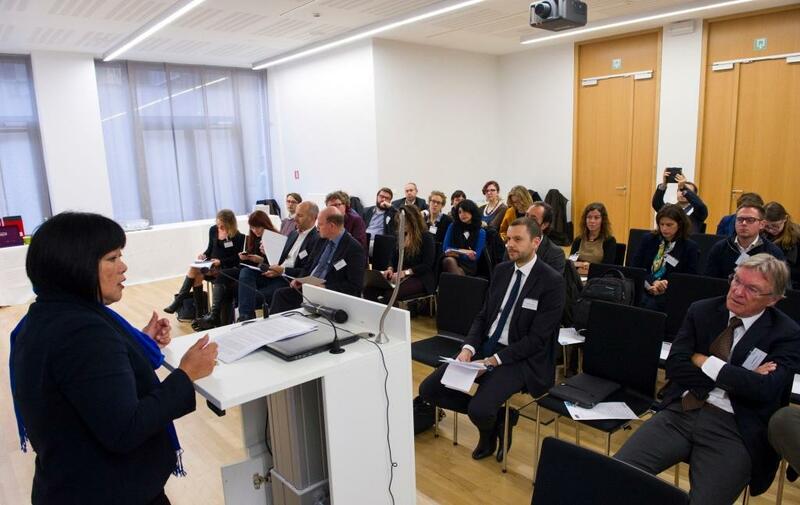 On November 17, the Open ENLoCC network celebrated its 10th anniversary in Brussels with a public meeting in the afternoon. The keynote speech was held by Mrs. Desireé Oen, long-term member of the EU Commissioner on Transport’s cabinet. It was followed by a series of “Pecha Kucha” presentations (i.e. 20 powerpoint slides, each presented for just 20 seconds) from the main institutions dealing with freight transport and logistics under a regional perspective in Europe. Each institution presented itself and its relation to regional logistics. The yearly General Assembly of Open ENLoCC was held in Bologna, hosted by the Open ENLoCC member Institute for Transport and Logistics ITL. 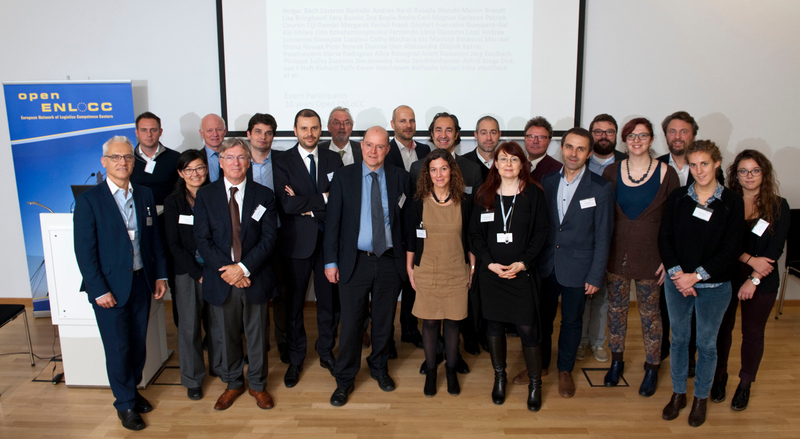 Project teams of SUCCESS and CITYLAB under the EU Horizon 2020 programme will join the event in Bologna. The second day was dedicated to exchange of knowledge and ideas among the Open ENLoCC members, as well as to the formal deliberations. Read more about this in the “European Review of Regional Logistics” 3/2016, which can be downloaded from the “who we are” section. Open ENLoCC member ITL, the Institute of Logistics and Transport in Bologna, holds the Presidency of our organization. In accordance with the Steering Committee, ITL named Giuseppe Luppino as the new President of the network. Giuseppe already won a high reputation among Open ENLoCC members, during international project work in the past years, and we all look forward to continue with our cooperation. Alberto Preti, President of Open ENLoCC from 2009, has left Open ENLoCC member ITL in Bologna. Since March 14, he is Associate at Steer Davies Gleave, based in Bologna. At Steer Davies Gleave, Alberto will lead the coordination of a team set to provide technical assistance and consultancy services to public and private organizations benefiting from EU funds targeted at the transport sector in Italy and across different EU Member States. With leaving ITL, his term as President of Open ENLoCC ends. He is succeeded by Giuseppe Luppino of ITL. On Monday, February 22, Open ENLoCC President Alberto Preti and Secretary Martin Brandt met with Desireé Oen, Vice-Head of Cabinet of EU Commissioner for Transport, Violeta Bulc, at her office in Brussels. Mrs. Oen is responsible for the topics dealing with logistics and as a reader of the “European Review of Regional Logistics” had suggested the meeting. Alberto and Martin used the occasion to introduce the Open ENLoCC network to Mrs. Oen and to debate those work topics of Open ENLoCC members which may be relevant to the agenda of the commission. In general the meeting served to show the variety and richness of the members competences which can be put at the disposal of the EC in the means and time the EC deems appropriate. In a new brochure (72 pages, issued in February 2016), the Open ENLoCC members present their knowledge and project experience. The reader is invited to check the member contributions for any needed competence in the field of regional logistics, and to contact each member individually as it seems fit. The brochure is available upon request via the Open ENLoCC members. The new brochure with the self-presentation of all Open ENLoCC members (November 2015) is available and can be downloaded from the “membership” page of this website. In 2015, the Open ENLoCC network has upgraded its regular newsletter into the quarterly “European Review of Regional Logistics.” It supplies information about the logistics trends and initiatives around Europe, with an eye to their consequences for the regions of Europe. You can download your copy from the “Who we are” page of this website. The Open ENLoCC General Assembly was held in Portoroz (Slovenia) on May 21 and 22 in conjunction with a CO-EFFICIENT project meeting. ALICE, the “Alliance for Logistics Innovation through Collaboration in Europe”, met in Brussels on October 13 and 14. Open ENLoCC is member of the ALICE mirror group. In addition, many Open ENLoCC members assembled on the afternoon of the 13th to debate the current Open ENLoCC activities, including the intensified networking among members. On October 14 and 15, Open ENLoCC as well as many of its members took part at the first European Forum of Logistic Clusters in Brussels. Group) institute of logistics professor Cathy Macharis of Brussels Free University and the Straightsol (7FP) and SMILE (MED ERDF) EU-funded projects. Besides Professor Macharis, keynote speakers were Professor Michael Browne and Professor Jose Holguin-Veras. The participants were welcomed by Joost De Bock of the European Commission’s DG Research. Keynote speakers will be Prof. Michael Browne of Westminster University in London and Prof. Jose Holguín-Veras of the Rensselaer Polytechnic Institute in New York. Following the introducing words of Rainer Wieland MEP about the role of logistics for Europe and its regions, Open ENLoCC President Alberto Preti explained with examples from the work of his competence center ITL in Bologna, how these centers in practice show politics fields of actions as well as options. Holger Bach, head of Stuttgart Region’s office for mobility and managing director of the region’s competence center KLOK, further elaborated this with examples of Stuttgart Region. Next, Carl-Magnus Carlsson of Malmö University in Southern Sweden took the bridge across Öresund as an example for the impacts of a larger transport infrastructure. This was followed by a lively discussion with the many experts from European regions which were present during the meeting. Open ENLoCC (European Network of Logistics Competence Centers) was established as a follow up of the “ENLoCC”-project and is an open network of regional logistics competence centres in the field of logistics, run by public authorities or similar bodies. The main task of the network is the international exchange of experience and knowledge between its paticipants and the promotion of a higher level of cooperation with European institutions. The members of Open ENLoCC work together on common projects with the aim to develop the regional economy by solving infrastructural, organisational and technological problems of logistics and transport. The dissemination of the results of the network activities and the best practices take place on a wide scale, involving all the key bodies at EU level. The founding of the network was financed in part through the Interreg IIIc programme of the European Union. Now the network is self-supporting through membership fees and activities. Open ENLoCC invites other regional competence centres in the field of logistics to join. The Open ENLoCC member institutions each hold a huge amount of regional logistics knowledge. Furthermore, typically each is a specialist in one or more topics, with a reputation across Europe. Therefore, the network as a whole probably is one of the most in-depth sources of logistics knowledge across Europe. The Open ENLoCC members offer logistics training and education or in any case have close ties to the relevant logistics training and education institutions in their area. In the past, several members have cooperated in the establishment of training courses under the “LOGtraining” label. More such cooperations are envisaged. The main European transport corridors are an important issue in European as well as in regional politics. For several such corridors, Open ENLoCC members cooperate on exchanging regional knowledge regarding these corridors, with an emphasis on freight transport. This has not only increased their knowledge, but also helped to establish formalized support projects for the improvement of these axes. 6th Km Charilaou – Thermi Rd. Membership of Open ENLoCC is open to all Regions, Local Public Authorities (also of Third Countries with an elected democrat government), Associations, public or semipublic bodies with related interests to Open ENLoCC and with a specific and explicit interest in founding a LoCC (Logistics Competence Centre) and to all existent LoCCs. Joining Open ENLoCC requires a formal procedure. According to the “Articles of Associations”, all applications have to be confirmed by the General Assembly. A membership goes along with a yearly fee. If you are interested in your organisation joining Open ENLoCC, please contact Mr. Martin Brandt at the secretariat of Open ENLoCC.